Scenarios are cognitive tools, not answers. Each scenario is a story; the whole scenario analysis is a story with multiple endings. The simplest legitimate scenario analyses are based on two dimensions (e.g., state of the economy, level of violence), generating four scenarios. Rosy Scenario and Impending Doom are the two extreme stories: Rosy Scenario representing the case in which both dimensions meet your highest expectations (e.g., booming economy and peace); Impending Doom is the opposite (e.g., crashing economy and war). The two remaining scenarios are mixtures. 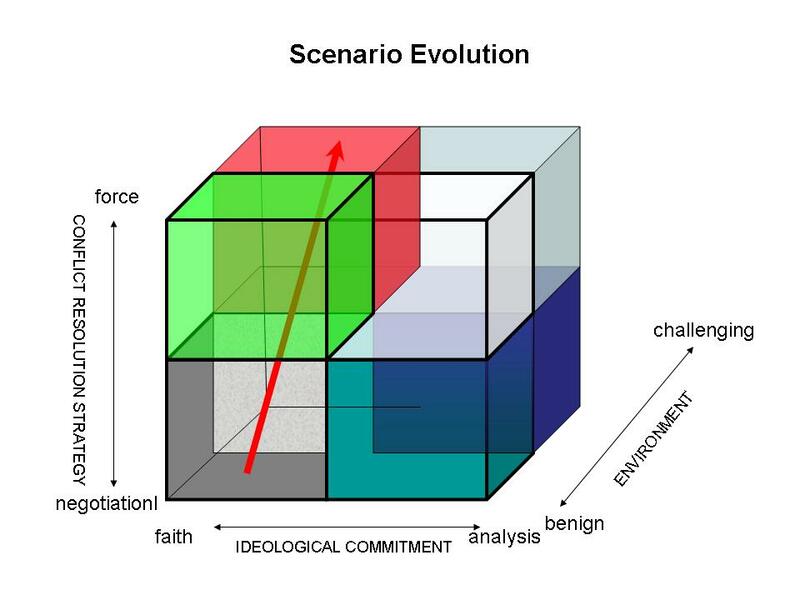 In common usage, politicians or others trying to sell their preferred outcome may offer the pretense of being unbiased with three scenarios: Collapse to the Extreme Right, Collapse to the Extreme Left, and My Moderate Solution, thus presumably forcing every reasonable person to select the pre-cooked outcome. Politicians completely addicted to hubris may simply parade on stage that gorgeous doll, Rosy. In both cases, the smooth talker is asking you simply to accept one scenario lock, stock, and barrel. This is a travesty for reality is a crooked path through the whole landscape. Scenarios should evolve…on the basis of past and forecasted events, theoretical understanding, forecasted milestones. To be effective tools, your scenarios need to evolve incrementally as you gain understanding. Scenario analysis creates several stories of possible futures. Scenarios should not be snapshots of your current guesses about the future; effectively done, they will be more like regions of a map—the kind of map based on rumor overheard in the Cairo marketplace by Livingston about a magnificient river arising in the hills far to the south in an unknown land, i.e., where you want to go will simply be marked on the map as a big blank space with the notation “here be dragons.” It is up to you to fill in the map as you proceed on your mental journey into the future. The above steps are intended not as directions but as an outline; e.g., note the simplicity of the endlessly complex Step 12. These 12 steps are, first, designed to send the message that “scenario analysis” per se is but the introduction to future analysis, a step designed only to provoke creative thinking, about as precise as the famous advice “Go West, young man.” Once such thinking seems to be occurring, it is time to transition to more rigorous methods. The second purpose of the above steps is to suggest that such a transition will require systems thinking, entailing both consideration of underlying dynamics and, even more challenging, complexity. Exactly how to do that for the future of the global political system remains a research issue. Two ways forward for developing the scenario analysis methodology are via the integration of A) graphics and B) computer models. Graphics constitute an important tool for rigorous scenario analysis because scenario analysis rapidly becomes cumbersome as the array of story lines expands exponentially. Serious scenario analysis, in words, tends to produce book-length analysis that can be highly thought-provoking but hard to apply to the real world. Graphics can aid in presenting clear summaries of how the proliferating of scenarios relate and in showing how an actual case might evolve. 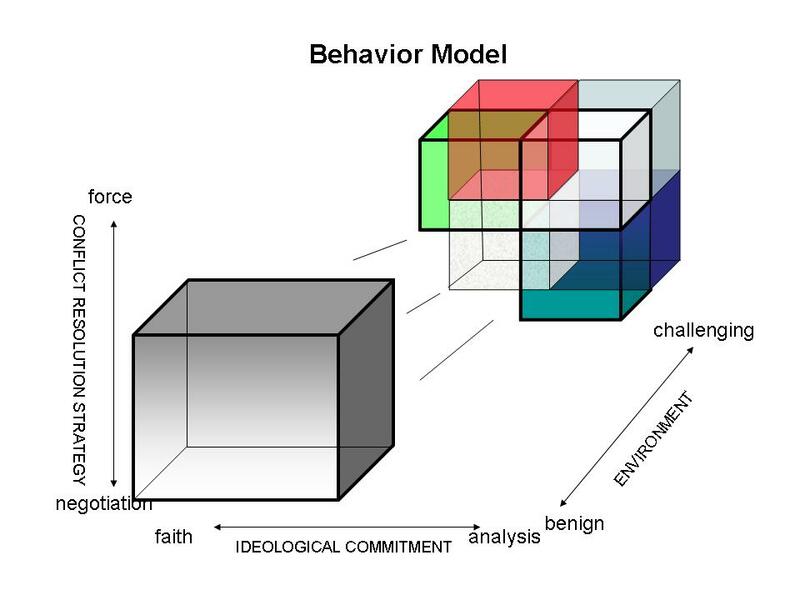 Three-dimensional models, for example, facilitate the presentation of eight, rather than four, alternative scenarios resulting from three, rather than two dimensions, as well as emphasizing how any particular scenario exists in a small portion of a large space of possible outcomes, thus guarding against one of the great dangers of scenario analysis in the real world–becoming enamored of your preferred scenario and forgetting how easily the situation could shift.